Ayrton Senna driving his McLaren-Honda MP4/6, Rascasse corner, in the 1991 Monaco Grand Prix. He won this race which was his fourth victory at Monaco. 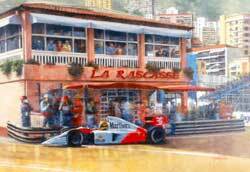 Juan Carlos Ferrigno currently has a permanent Exhibition of art at Café Grand Prix, 50A Berkeley Street, London W1 and you are welcome to view between 9am-12.30pm and from 3.30pm-6pm Monday to Saturday. FERRARI EXHIBITION 2000 to celebrate "40 years of Maranello Concessionaires"
Luca di Montizemolo, President  Ferrari Spa chats with ex Ferrari drivers Tony Brooks and David Piper. 1979 Formula One World Champion Jody Scheckter in discussion with Ross Brawn Technical Director, Ferrari Gestione Sportiva. MASERATI EXHIBITION 2001 to celebrate "75 years of Maserati"